Continuing my interview series called THE SEVEN, in which I invite some of my favorite authors to answer seven questions about their most recent projects, today’s guest is the lovely Alexandra Sokoloff, prominent screenwriter and author of the bone-chilling supernatural novels THE HARROWING, THE PRICE (which I would argue gives SESSION 9 a run for its money for the title of creepiest hospital in horror), THE UNSEEN, BOOK OF SHADOWS, the paranormal thriller THE SHIFTERS, the YA supernatural thriller THE SPACE BETWEEN, and the suspense thriller HUNTRESS MOON. 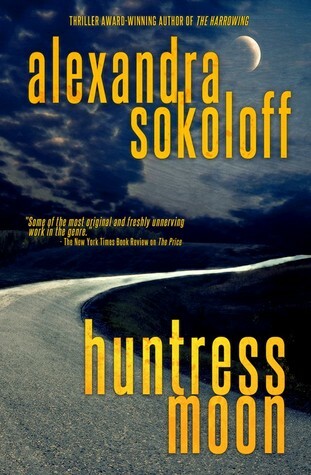 HUNTRESS MOON is just out, my first direct-to-e thriller, the first in a series about a driven FBI agent on the hunt for that most rare of killers: a female serial. I’ve written a few serial killer stories as a screenwriter and novelist, and have done years of research into the psychology of sexual homicide. I think most serial killer novels are absolutely ridiculous in the way they portray those killers as poetic or artistic, all those lovely thematic tableaux of death, and the killer leaving little notes for the detective quoting from Shakespeare and Milton and Shelley. Please! And specifically I wanted to write a story that dealt thematically with the question of why we don’t see female serial killers. Yes, I know you’re about to bring up Aileen Wuornos. Or maybe you aren’t, but five hundred other people out there are! But Aileen Wuornos killed in a pattern that’s actually characteristic of a spree killer: she had a violent trigger incident and then killed a number of men in a very short time. And there was definitely an aspect of vigilantism to that spree. I wanted to explore the psychology of a woman who turns to violence, and a man in pursuit of her who finds himself ambivalent about her motives and actions. What is the primary theme you’ve chosen to explore with this project? I read your mind and already started to answer this question above – I am always thinking of theme first! Another running theme of the book – and of the whole series as I see it – is hunters and hunted, and the eroticism of that hunt between the two main characters, the way they mirror each other. And themes of violence, moral response to violence, and justice. Of everything you’ve written to date, which project has been the most difficult for you? I would have to say my second novel, THE PRICE. It is just SO DARK: someone who may or may not be the devil is walking the wards of a children’s hospital making deals with the patients and their families. I had to live in a very bleak place to write it, to capture what it would really mean to sell your soul. I wasn’t much fun while I was writing it. Which title would you suggest as a good place to start for newcomers to your work? That’s a good question and I never know how to answer it! So far I’ve written standalones so it really depends on the world that the reader wants to inhabit or the subject matter they’re craving; that’s how I choose my reading, anyway! If you’re looking for a nail-biting, roller coaster ghost story, that would be THE HARROWING. I’m partial to BOOK OF SHADOWS, a police procedural that pairs a Boston homicide detective with a practicing witch from Salem in a race to catch a satanic killer. That one walks the finest line between supernatural and crime thriller, a state of ambiguity I particularly like in horror, myself. And if you want dark without supernatural, that would be HUNTRESS MOON. What are your thoughts on the burgeoning digital market? I LOVE IT. It’s the best thing that ever happened to writers (as I know you know!). I feel as if some benevolent deity raised a hand and said, “Yes, children, you DO deserve to make a great living writing exactly what your heart tells you to write. Live long and prosper.” Okay, maybe I’m mixing my deities but… I feel like I’ve died and woken up in some kind of heaven. We now have direct, instant access to hundreds of thousands of readers. And as a reader, I am enraptured that the entire world of books now fits in the palm of my hand: any book I want, anywhere I am, instantly. I’m writing the sequel to HUNTRESS MOON, hopefully to have out in October, maybe November. It’s my first series, and now I understand why people do it. You’re not starting from scratch! Amazing! And I want to to continue my very dark YA thriller, THE SPACE BETWEEN, as a trilogy… it’s about parallel universes and there are just so many possibilities. This entry was posted in Uncategorized and tagged Aileen Wuornos, Alexandra Sokoloff, Harley Jane Kozak, Heather Graham, horror, Kindle horror, kindle thrillers, Serial killer, Thriller (genre), YA. Bookmark the permalink. Thanks for the great interview, Kealan! And I’m so glad to hear you liked The Price, especially enough to compare it to Session 9, one of my top ten favorite horror movies, I have to say. It’s a bit of a synchronicity, actually – Session’s brilliant writer/director Brad Anderson is largely responsible for my entire career as a novelist. He was attached to direct my script of The Harrowing, and it was so fantastic working with him that when he dropped out of the film, I just couldn’t bear to start over with a new director, so I wrote it the story as a novel instead, my first. One of those things that seems like a complete tragedy at the time that turns into maybe the best thing that ever could have happened! Wow, Alexandra, I had no idea! SESSION 9 is also a huge favorite of mine (woefully underrated, I think), as is his follow up THE MACHINIST. And while ultimately things worked out on your end, one can’t help but wonder what he could have done with THE HARROWING. And I am also a huge fan of Session 9! Yeah, Kealan, I think about what Brad’s Harrowing would have been like all the time. But you know, you never know what’s going to happen. I never expect anything from Hollywood but I never give up on miracles! It’s a very cinematic novel, so I suspect it’ll end up on that silver screen eventually! Hi Jon! I love this series of Kealan’s – so many great authors tackling the same questions. All this talk about Session 9 makes me want to see it again. Maybe I’ll do a breakdown on my blog…. I would love to see that, Alex! Hi Alexandra! I do, too. That would be great!